Papers: 1972-1992, 4.35 cubic feet. Administrative papers of former Congressman John R. Miller while he served as city councilman and U.S. representative of Seattle, Washington. 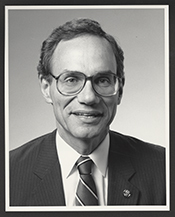 The papers primarily include outgoing correspondence from his service on the Seattle City Council, 1972-1979, as well as legislative and subject files (1990-1992) from his congressional service (1984-1992). A finding aid is available in the repository and online.